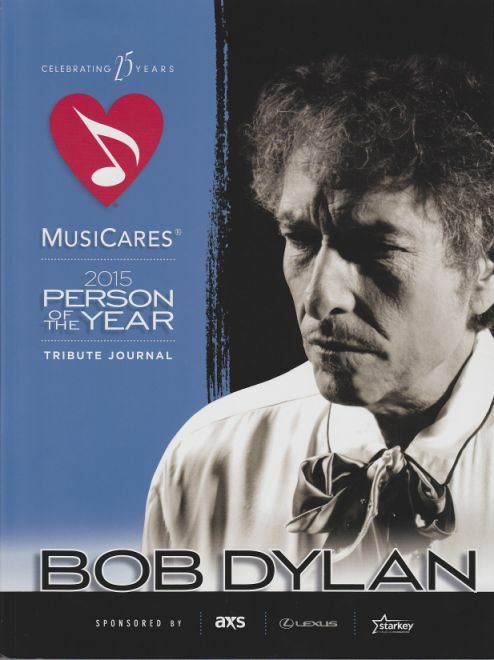 On February 6 2015, at the Los Angeles Convention Center, Bob Dylan accepted the MUSICARES PERSON OF THE YEAR AWARD 2015 from ex president Jimmy Carter, both figures shared their thoughts on what the organization does for musicians who need assistance with substance abuse and life's issues such as healthcare. Stars like Bruce Springsteen, Neil Young, Jack White, and Crosby, Stills and Nash performed the great songwriter's classics and talked about his legacy. Dylan himself took a rare opportunity in the spotlight to deliver a 30-plus-minute acceptance speech. Expansive, funny and insightful, he didn't pull any punches, calling out songwriters who had criticized his work while indicting Nashville and commercial country music. MusiCares 2015 Person of the Year Tribute Journal. The pages are unnumbered but it is perfect-bound and about a little over 1 cm thick. Estimated about 200 pages. Apart from details of the event and thanks to all those involved, it contains dozens and dozens of tributes to Bob. Some are a little bizarre but most are fairly straightforward. Some are linked to Bob but others seem to be supporters of MusiCares with little direct connection to him. Those honouring Bob include fellow musicians, record companies, studios, promoters, performance rights organisations, venues, radio stations and so on. One of the more unusual is from Pet Heads products. Many thanks to Ian Woodward for the information and scan.